Summer of 1995. I had just finished my freshman year of college and had quite the Birkenstock tan on my feet. I was living in my parents' NJ home when the call came, from my friend Kevin: "Lynn, Jerry's dead." It took me a second - I racked my brain to figure out who Jerry was. Ohhhhh. Jerry Garcia. I had been listening to a lot of the Grateful Dead since the early nineties but I wouldn't call myself a "Dead Head," especially since I had never gone to one of their concerts. (I was, however, a full-on Phish Freak.) Shortly after his death I discovered rrriot girl music, then hip hop, and my faux hippie phase was over. I still have a soft spot in my heart for those tunes, though. Earlier this summer we watched Long Strange Trip and it brought me back to those times. The docuseries is so well-done, even Abe enjoyed it. He does not like The Grateful Dead music at all, but he did love this snack I whipped up in honor of Jerry. 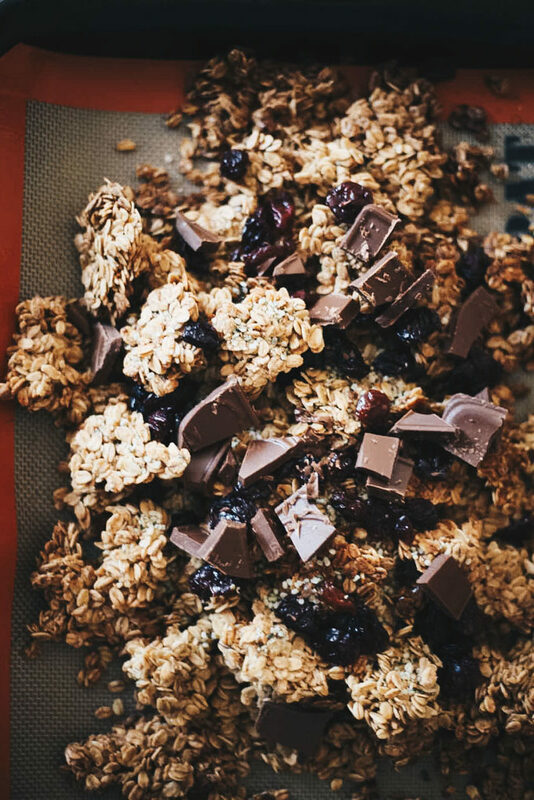 My go-to granola recipe is by America's Test Kitchen - I like it super clumpy and their method helps you achieve just that without the use of egg whites, which means it's vegan. I added hemp seeds (duh), plus dried cherries and chocolate to give it that now-classic Ben and Jerry's flavor. It tastes great on top of Cherry Garcia ice cream, of course. In a large bowl, mix together the maple syrup, brown sugar, vanilla, salt, and oil. Stir in the oats. Spread the mixture into the prepared baking sheet lined with parchment or a Silpat. Press it evenly to compact the oats with the back of your spatula. Bake for 30-40 minutes. Rotate the baking sheet halfway through cooking. When granola is lightly brown, it's done! Cool on a wire rack for 1 hour. 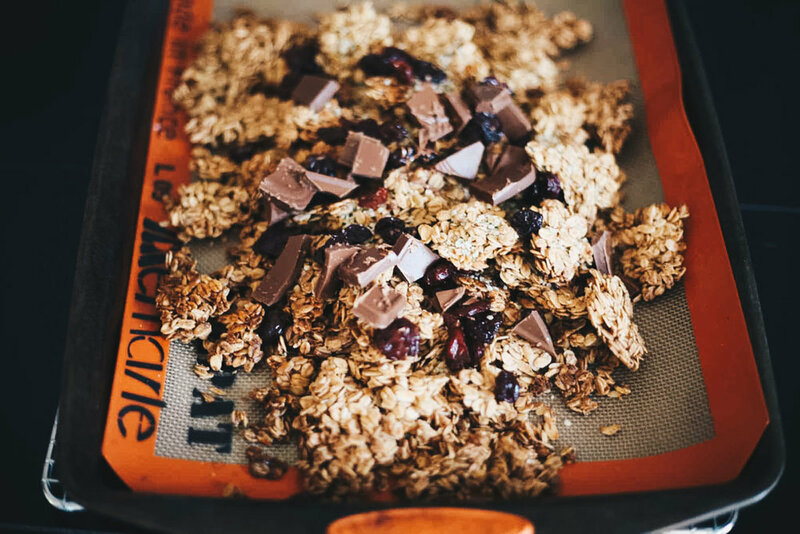 When granola is cool, break into clusters with your hands and mix in the hemp seeds, dried cherries, and chocolate. Store in an airtight container up to 1 month. Have you ever had a Matzo Latke before? They are basically pancakes made out of matzo meal. Abe's mother, Wendy, tells me that they aren't very common in most Jewish American households. Most people use their Manischewitz canisters for Matzo Balls. Here is her grandmother's recipe, which could not be simpler. It's just a few ingredients cooked up in her cast iron skillet (which Wendy has also demonstrated how to clean before). They're delicious plain, with some salt on top, or sweet with maple syrup or jam. Wendy also puts out a traditional (potato) latke topping of applesauce from Solebury Orchards. I think you can guess which version the sugar addict (me) prefers. I think they're pretty egg-y, which makes them the perfect protein-packed breakfast option. It's fun to make a batch of these and serve the straight from the skillet into people's plates. My niece Zadie likes them too. I love hearing Wendy's story about how her grandmother made her special, crispy "tiny latkes," which were actually just extra batter drips on the side of the skillet. Video below! Melt ¼ stick butter in microwave for 40 seconds. Crack 6 eggs in a bowl and scramble with a fork. Add the melted butter, plus salt. Add matzo meal and enough water to form a runny consistency. In a nonstick skillet, melt a tablespoon butter over high heat. Add the matzo latke batter one spoonful at a time. Flip when bubbles form and the bottom is golden brown. Serve as is, or with jam and maple syrup. Baking a Low Sugar Pumpkin Bread recipe with Sucanat from America’s Test Kitchen’s new cookbook, Naturally Sweet. How to eat Halloween Candy for breakfast. Tomato and Eggs is a very popular Chinese dish; it was one of my father's favorites. I decided to do my own spin on it for Abe this morning - who was in the mood for a quick breakfast while editing the Brother Orange movie. As usual, we hit the Sunday's Farmer's Market, where I picked up fresh tomatoes, scallions, and free-range organic eggs. Look at those happy, yellow yolks! The secret weapon - soy sauce - for that special umami flavor. Also, I use chopsticks to whisk the eggs, and stir them in the pan, too - this will produce smaller, more delicate curds - and won't damage the non-stick skillet! Some recipes have you cook the scallions/tomatoes with the eggs; I left them separate for a fresher, more deconstructed take. Abe said they were "Amazing" and coming from him, that's a big deal. I think my pops would've liked them too. Crack the eggs into a bowl. Add soy sauce, and whisk with a pair of chopsticks, until the yolk/whites are combined and the color is uniform, dark yellow. Place butter in a small, non-stick skillet over medium low heat. Once melted, add the eggs and immediately start pushing them around (with the chopsticks) until they start leaving a trail in the pan. When the eggs are no longer runny but still look a little wet, immediately remove from the heat and place on a dish. Garnish with scallions, and serve alongside the sliced tomatoes (sprinkled with salt/pepper to taste).